Honeycomb Learn is a webcast series designed to educate DevOps teams about what observability is and how to get started. Observability-driven development is the ability to ask any question about your production systems so you better understand and debug when incidents occur. Teams ship code confidently, learn continuously, and spend more time innovating. Nathan LeClaire, Sales Engineer @honeycombio knows first-hand that the key to instrumenting code is to start with baby steps. With Honeycomb, a little instrumentation will give vast insights as soon as you ingest your data. With Honeycomb Beelines, we take the heavy lifting out of instrumenting. *how to start small and get quick wins. You will also see a short demo of Honeycomb's NodeJS Beeline. See Honeycomb in action, hear best practices, and learn how fast and painless instrumentation can be. The power of Honeycomb lies in the way you analyze production data using different interactive views. See what's happening across many dimensions (fields) in your system with BubbleUp. Pick the timeframe, breakdown by any field, such as customer name or ID, then filter by a specific dataset or where any errors occur. The query results in a heatmap that highlights events over the baseline, over time. Use BubbleUp to select outliers on the heatmap and drill down to all related fields in that data. It will help you understand which part of the code is misbehaving. *BubbleUp lets you drill down to see exactly where problems are occurring... blazing fast! See a Honeycomb product demo and learn the value of real-time analysis across system events. Troubleshoot issues AND understand how production is behaving right now. 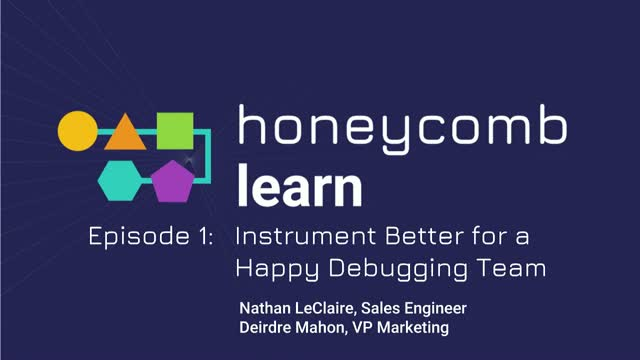 Second episode in our Honeycomb Learn series looks at how to cut stress levels when debugging issues in production. Starting with a hypothesis, run fast queries and then navigate to the code where the problem lies. Be proactive and set triggers to let you know if something needs attention. When engineering is about to ship a new release, set a feature flag to watch how production behaves in real-time. Curtail performance issues and reduce customer impact with the right tools to better understand production systems, right now. * Set feature flags to control specific parts of your environment to reduce stress levels. See a Honeycomb demo, ask questions and learn more. Brian Dawson and Michael Wilde chat about CI/CD and o11y: how o11y lets teams continuously integrate, continuously deliver... and continuously improve software with better code and better practices.